It's a thin-and-light spec fight! Here's how the Surface Laptop compares to the competition, at least on paper. Dell XPS 15 vs. MacBook Pro 15: Fight! 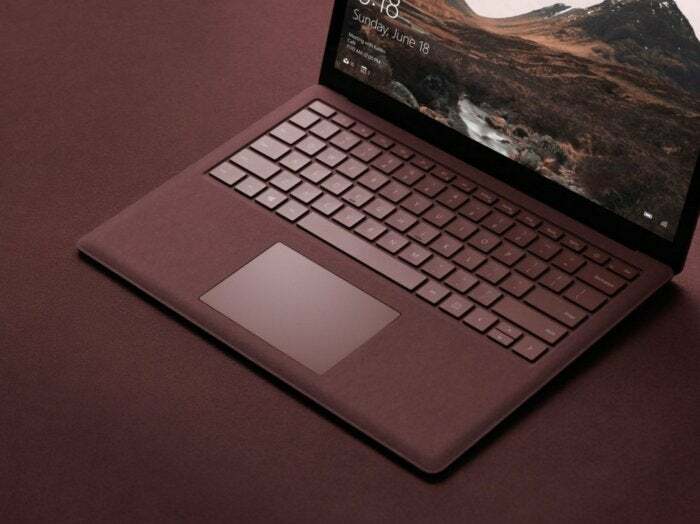 Microsoft has called its new Surface Laptop the one to "reset the category." That's a lofty ambition for a PC that is essentially wading into a gladiator pit. Unlike the Surface Pro and the Surface Book, which can stay above the fray with ultra-expensive, unique features, the Surface Laptop is just another thin-and-light clamshell, territory well-trod by proven contenders including Dell's XPS 13, HP's Spectre x360 13t, and of course, Apple's MacBook Air. While I haven't actually touched a Surface Laptop to see whether its luxurious Alcantara fabric changes my expectations, I do know no computer ever escapes the scrutiny of bang for buck. I decided to see just what you get out of the Surface Laptop and comparable Apple, Dell and HP laptops at the four popular price points of $1,000, $1,300, $1,500 and $2,000. Be warned: Some things just can't be measured in numbers, such as keyboard feel, screen quality, build quality, and OS preference. Microsoft also hasn't released which exact parts are going into the Surface Laptop, so to some degree this is an educated guess. One Surface Laptop mystery, until independently verified, is battery life. At 14.5 hours per Microsoft, it'll likely set the bar for run time. At the same time, most of the other laptops here aren't slouches either. What does the Surface Laptop offer when compared to a MacBook Pro 13? A thousand bucks is the entry level price for a "luxury" laptop, the point where you can wriggle free of thick, ugly plastic and enjoy plusher materials like aluminum and carbon fiber. For a luxury laptop, however, it's also almost too cheap. You can't get fancy materials and features unless corners are cut. You can easily see what Microsoft did to hit the $999 price. Of the four laptops here, the Surface Laptop's the only one with 4GB of RAM. For general use such as browsing and running Office, you can get by if you have a fast drive behind it. It's still not optimal, though, and if you like to run a ton of apps and spawn dozens and dozens of browser windows, you'll want more RAM. 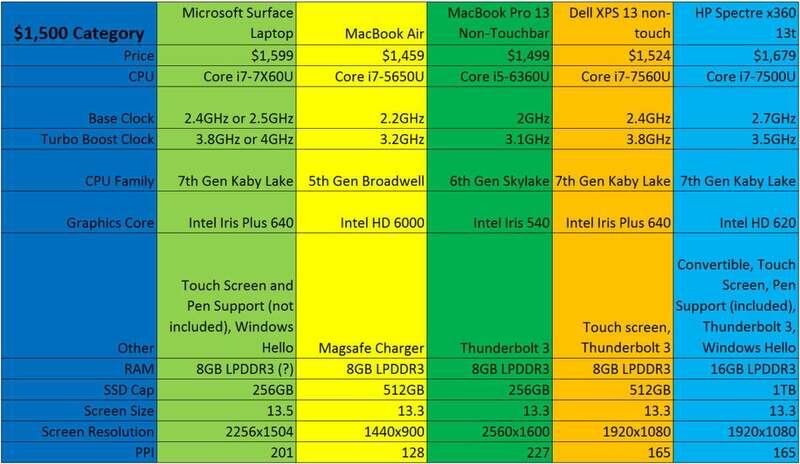 On the performance front, the slowest is likely to be the MacBook Air. It is running a two-generation retrograde CPU at this point, and it has the lowest maximum clock speed. On paper, the Surface Laptop's performance could be easily 20 percent faster than the MacBook Air on CPU-intensive tasks. I know this because I've tested three generations of these CPUs. 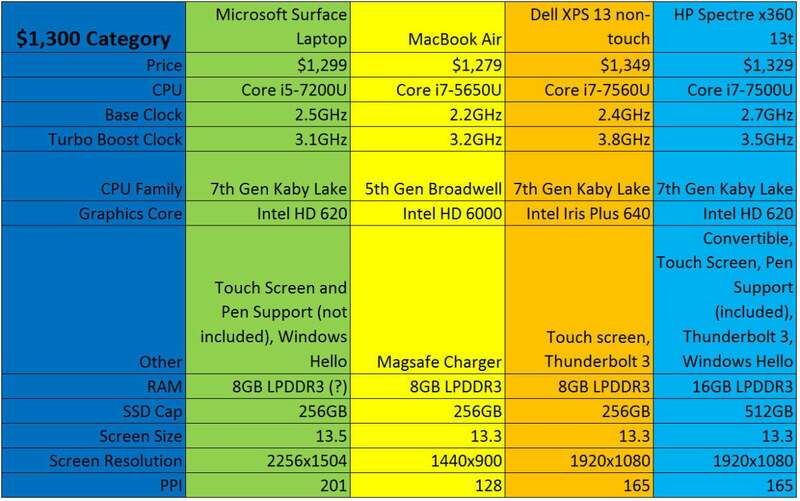 The Dell XPS 13 should be among the fastest here (and likely as fast as the Surface Laptop), while the Spectre x360 will be the slowest of the Kaby Lake laptops. 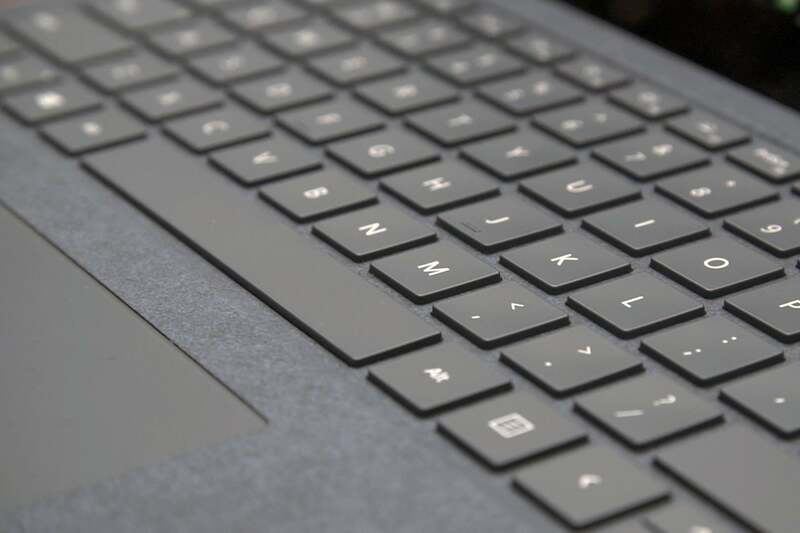 The Surface Laptop has a fancy Alcantara cloth keyboard. That's by design, though. The Spectre x360 is the only product here that converts into a tablet. Because tablets get held against your body, HP's understandably trying to keep them from producing more heat. A consequence is dialed-down performance. The best value here (although it is $70 pricier) is the Spectre x360 13t, which gives you Windows Hello, an active digital pen and an SSD that is twice the size of the others. The worst value is probably a tie between the MacBook Air and the Surface Laptop. In addition to its older CPU, the MacBook Air 13's TN display has a resolution that's downright atrocious in 2017. I strongly suspect that the one with the best screen (a very important feature for many) is the Surface Laptop. It has a markedly higher resolution than the others and a very pleasant 3:2 aspect ratio. What pushes the Surface Laptop into the not-good-value range is that RAM, which seems pretty chintzy for $1,000. At $1,000, the Surface Laptop is a clamshell full of compromise. The sweet spot (especially for a laptop you expect to use for four years or more) is really about $1,300. At this price, RAM and storage pretty much doubles across the board. At this price, the Surface Laptop also really moves into a comfort zone. In storage and RAM it's on a par with the slightly cheaper MacBook Air 13 while still giving you a much better screen and a faster CPU, as well as Windows Hello, pen support (although the pen itself is optional), and 10-point touch. Unfortunately for the Surface Laptop, the PC OEMs pack in the features, too. While the MacBook Air and Surface Laptop give you Core i5 performance, Dell's XPS 13 features a much faster Core i7-7560U. Besides a higher boost speed of 3.8GHz, the XPS 13 also features the much faster Intel Iris Plus 640 graphics core. 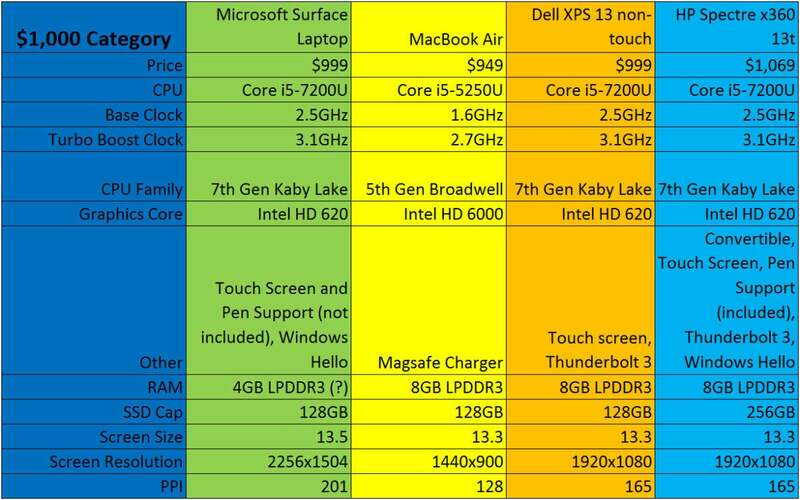 This means the XPS 13 is almost certainly the fastest laptop at this price. HP doesn't just give up, though, and it again gives you the most value with 16GB of RAM and a 512GB SSD. Don't forget its convertible capability and included active pen. At $1,300, all of the laptops involved really hit their tipping point of usability and features but the Dell has the fastest CPU and the HP gives you double the amount of RAM and storage. As we move into the $1,500 price range, it's now rich enough that Apple has two entrants. The first is a seriously hopped-up MacBook Air 13. 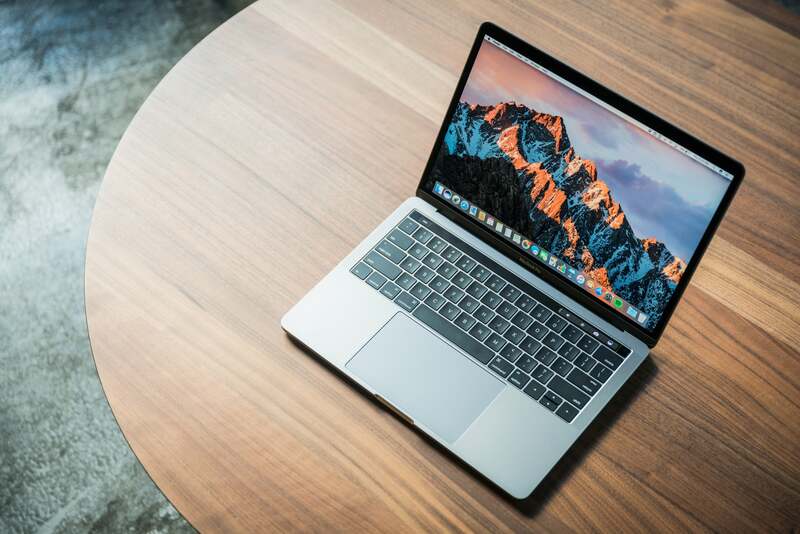 With a Core i7-5650U CPU and a 512GB SSD, it's the most expensive MacBook Air 13 you can get. It's also a configuration that probably doesn't make much sense, because even though you get a beefier SSD, you're still stuck with that horrid low-resolution screen. A better choice that actually feels a lot more modern is Apple's cheapest MacBook Pro 13. It has a high-resolution screen, Thunderbolt 3 ports, and a faster 6th-gen Skylake CPU with Iris 540 graphics. It is basically a much better $1,500 laptop on paper and in use (if you can stand the Butterfly keyboard). You can also see how much Microsoft wants the Surface Laptop to compete. For about the same $1,600, the Surface Laptop one-ups the MacBook Pro 13 with a 7th-gen Kaby Lake CPU and faster Iris Plus 640 graphics. Microsoft touts the performance of the Surface Laptop as being "faster" than the MacBook Pro 13, and it likely is—just not by much, so I wouldn't get too hung up over it. As we've seen before, though, there's little bang for the buck from Microsoft or Apple. For that we look to Dell and HP. At $1,500, Dell gives you a faster Kaby Lake CPU with Iris Plus 640 graphics, and twice the SSD capacity of both the MacBook Pro 13 and the Surface Laptop. In performance, you can expect the Surface Laptop and the XPS 13 to be in front. Although slightly more expensive at $1,679, HP really punches out the specs with a giant 1TB SSD and twice the amount of RAM as the others. This in addition to the included active pen, the convertible feature, and Windows Hello. Where the Spectre can't compete though is on performance. The Spectre does have a faster Core i7 at this price, but the processor is likely to fall behind the Surface Laptop, MacBook Pro 13 and the XPS 13 in CPU-intensive chores. Graphics will lag, too. The Spectre x360 certainly looks like the "value" contender, but if you want that CPU and GPU performance, the XPS 13 just might eclipse it. At $1,500, Apple gets to enter the MacBook Pro 13 as well as a hopped-up MacBook Air 13 to go up against the Surface Laptop. Once you pass the $1,500 mark, it almost feels like you're just looking for ways to burn money rather than buying on specs. Looking at the contenders, Apple's budget MacBook Air drops out because it's not expensive enough. The remaining MacBook Pro picks up the fancy-pants OLED touchbar. You also get double the RAM and storage of the entry-level MacBook Pro 13. The Surface Laptop stays lock-step with the MacBook Pro, with the same 16GB of RAM and 512GB SSD. Even with a price pushing $2,200, Microsoft still doesn't toss the Surface Pen into the box, which is a shame. At more than $2,200, we've also eliminated the HP Spectre x360 13t, whose fully loaded configuration stops at $1,600. 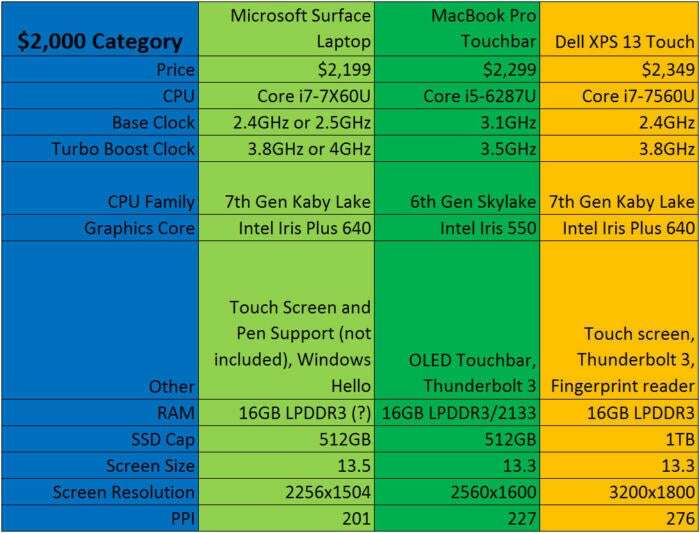 The laptop with the most "value" would probably be the Dell XPS 13, which gives you a fat 1TB SSD and a touchscreen with the highest pixel density. You will give up battery life, though: Previous iterations of the XPS 13 with the high-resolution panel and Iris graphics have not impressed us. In fact, I wouldn't ascribe any of the laptops you see here with much value at all. Maybe at $2,000, you look at Microsoft's Surface Book instead, or a more powerful and more capable 15-inch laptop. Spending more than $2,000 on a dual-core laptop feels excessive.